Hiking. It’s one of most searched-for terms on the Visit Bend website, and nearly half of Bend visitors have the activity on their bucket lists. Even in winter months, everyone still wants to hike. True, some of the high-elevation hikes are off-limits this time of year, but you’ll still find gobs of great spots to hoof it without snowshoes. Here are eight of my faves. 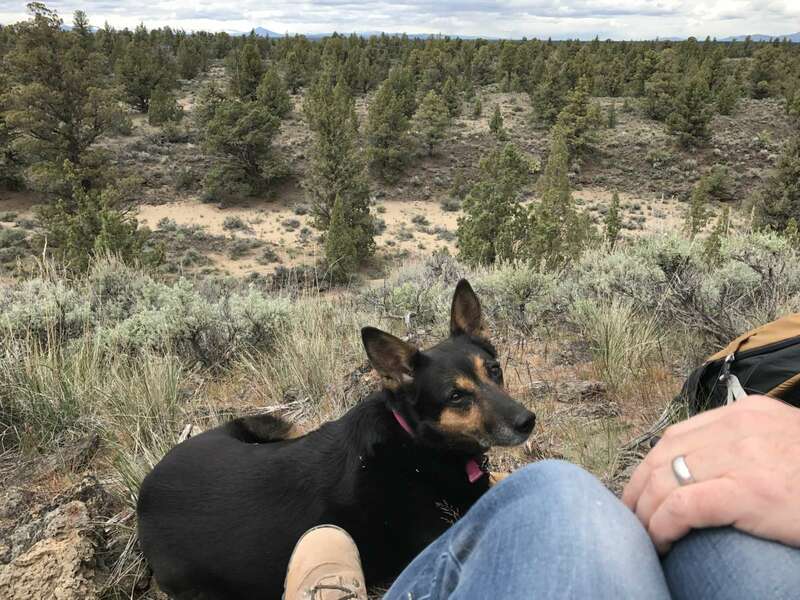 Blogger Tawna enjoys the Oregon Badlands Wilderness with husband, Craig, and Bindi pup. My love of this sprawling 29,000-acre desert landscape a few miles east of Bend is well-documented on this blog, but I love the Oregon Badlands Wilderness best of all in wintertime. Snow is sparse, and there are dozens of trailheads offering access to stunning desert canyons, ancient junipers, craggy basalt cliffs, massive lava flows, and wildlife ranging from falcons to packrats to deer. The vastness of the area means it’s a good idea to study a map before heading out so you know where you’re going. My personal faves are the Dry River Trail, the Larry Chitwood Trail, and the Ancient Juniper Trail loop combined with an in-and-out hike to Flatiron Rock. Bring plenty of water, and don’t expect any facilities like restrooms or trash cans. It’s rustic out there, which is exactly what makes it special. Why is Pilot Butte the perfect hike in wintertime? For starters, the paved road to the top is closed to cars in winter months, so you’ve got two traffic-free trails to the top of this 500-foot extinct volcano that’s smack dab in the center of town. The 360-degree views you’ll get from the top make it a fab place to catch sunrises and sunsets, not to mention orienting yourself to the area. You’ll see the Cascade Mountains to the west, the Badlands to the East, and prominent landmarks like Downtown Bend and the Old Mill District along the Deschutes River. Watch for icy patches in the shade, and tread carefully if you choose to go when the light’s dim. Where the Badlands offer the best of Central Oregon’s desert landscape, Tamolitch offers the opposite with an abundance of towering mossy trees and damp earth. Getting here requires a drive of about. 1.5 hours southwest of Bend, but that makes it a perfect day trip (especially when you reward yourself with a soak afterward at nearby Belknap Hot Springs). 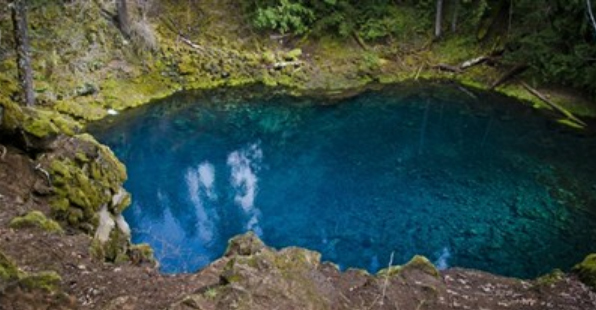 Tamolich Pool, also dubbed The Blue Pool, along the McKenzie River about an hour from Bend. I’m partial to starting from the trailhead near Carmen Reservoir or Trailbridge Reservoir, which gives you plenty of great river and forest scenery capped off with magnificent views of the Blue Pool. If you want to stretch things out, start at the Koosah Falls parking area for an 8+ mile hike that throws waterfall views into the mix. Bring a snack to enjoy from the viewpoint above the pool, and plenty of water to fuel you along the way. Don’t forget to pack out any trash you create along the way. You’ll find more ideas for Leave No Trace hiking here. Not to be confused with Tamolitch, the Tam-a-lau Trail is opposite both in the direction you drive to get there and the scenery you’ll see along the trail. Views from the top of the Plateau on Tam a Lau Trail are breathtaking. Located in Cove Palisades State Park, the trail involves a mile-long ascent up to a lava plateau, followed by a four-mile loop hike studded with jaw-dropping views all the way around the rim. 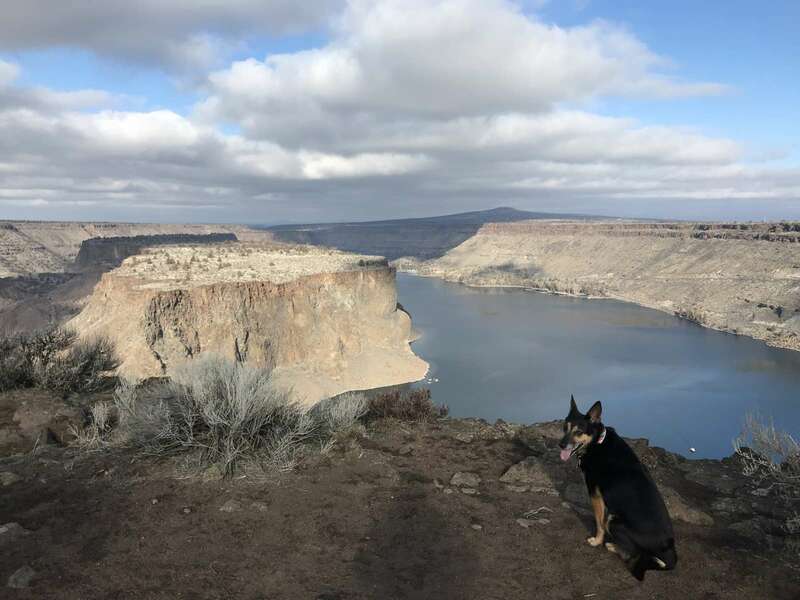 You’ll see both the Crooked River and Deschutes River arms of Lake Billy Chinook, along with killer views of The Island, a smaller plateau that’s off-limits to hikers. Since this place is packed in summer months, winter is the best time to enjoy plenty of quiet and solitude that you can’t get at the peak of jet boat season. Keep in mind that the one-mile ascent is pretty steep, and can be icy in wintertime. It’s not a great pick for years with heavy snow, but it’s been perfect in early-2019 with our relatively low snowpack. A great pick for waterfall chasers, Steelhead Falls is only about a half-mile from the trailhead, but what a half-mile it is. The canyon walls are lined with colorful grooves that show the erosion of time and water, and the splash of water soothes your soul. Tossing rocks during a wintery hike at Steelhead Falls. A relatively easy hike, there are a couple steep sections that can be slick in icy conditions. Take your time, and plan this adventure for a snow-free day. You might also consider combining this one with a visit to Smith Rock State Park. Smith Rock State Park is regarded as one of the seven wonders of Oregon, and for good reason. Towering basalt cliffs, gorgeous river views, and jaw-dropping landscapes will leave you gaping in wonder at every turn. 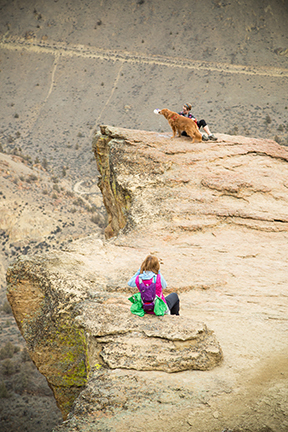 Smith Rock can be hot and crowded in summer months, but in wintertime it’s juuuuuust right! If you’re feeling more ambitious, hike up the Misery Ridge Trail (elevation 3,360 feet) for killer views of the entire Central Oregon Cascade mountain range. And no matter which hike or climb you choose, make sure to stop along the way and stare at the river for a few minutes. Odds are good you’ll be rewarded by views of river otters frolicking in the cool water. Confession: This hike is the first spot I confessed my love to the guy who’s now my husband, so it holds a special spot in my heart. Spellbinding winter views from Suttle Lake. 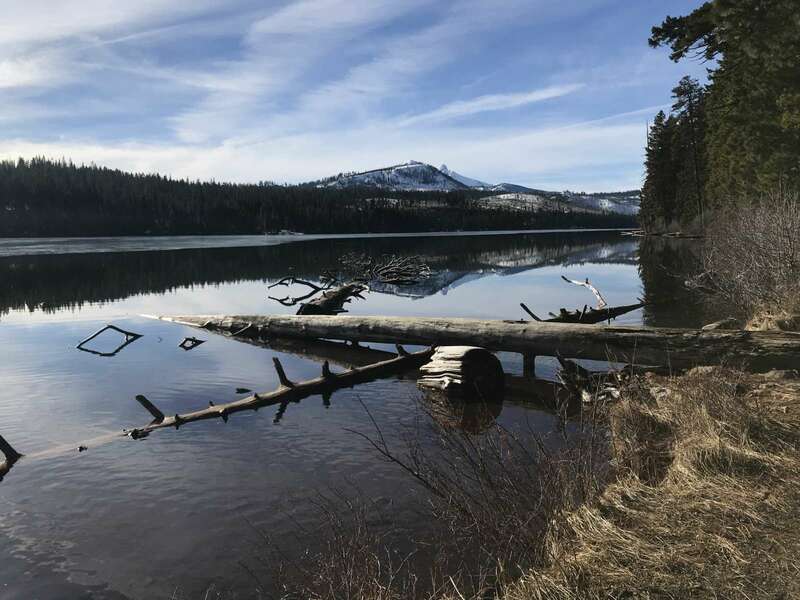 The hike around Suttle Lake is a 3.6-mile loop that’s relatively flat the whole way around. Snowier years will find the trail covered over, but low-snow years will leave mostly bare pathways along the east and north sections of trail. Be prepared for icy conditions along the south side (Yak Traks are a great idea!) and be prepared for breathtakingly beautiful scenery all the way around. I’m partial to starting at the Lodge and hiking counter-clockwise, doing the bare sections of trail first so I’m warmed up for when I hit the slick parts. Cap off your hike with breakfast or lunch at Suttle Lake Lodge. 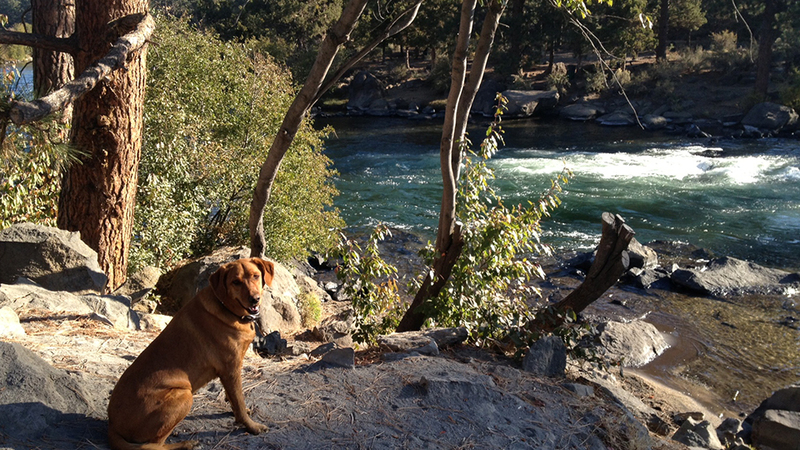 Both lodge and trail are super dog-friendly, so this is a nice one to bring Fido along. Be sure to pick up after your pooch in the spirit of our Visit Like a Local initiative. 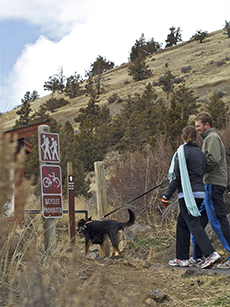 The Deschutes River Trail is another good option for hikers who prefer to stick close to Bend. So many sections of the Deschutes River Trail to choose from! The main trail starts at the Meadow Camp picnic area just off Century Drive. You can access a lot of other trailheads off FS road 41, so pick your starting point and your route depending on your skill and endurance. To keep it nice and short, try the Meadow Camp to Lava Island hike, which clocks in at just over a mile. If you’re game for a bigger hike, you can hoof it all the way from Meadow Camp to Benham Falls, passing Lava Island Falls, Aspen Camp, and Dillon Falls along the way. That one will require about 8.5 miles of hiking, so plan accordingly. The nice thing is that you can set out from Meadow Camp and decide along the way what you feel up to. If everyone’s still feeling strong after a couple miles, keep going. If someone in your party (possibly a parent) has a temper tantrum meltdown after mile one, just head back. Easy-peasy! No matter how far you go, you’ll be treated to splendid views of the Deschutes River and the towering ponderosas and lava rocks that line the trail. This is a pretty well-trafficked trail in summer months, so winter is a great time to experience relative quiet out there. Previous article: Tawna’s roundup of top Bend events for 2019!